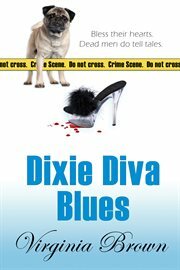 The item Dixie diva blues, by Virginia Brown, (electronic resource) represents a specific, individual, material embodiment of a distinct intellectual or artistic creation found in Austin Public Library. Trinket and the Gang Will Stop At Nothing To Clear A Diva's Husband of Murder Charges. "You'd think a midnight prowler would have sense enough to get out after being discovered by a group of middle-aged women armed with flower vases. Or at least stop what he was doing. Not this one. Despite our menacing appearance, he kept opening cabinet doors and drawers. "Our intruder wore what looked like a black Ninja outfit. It did not flatter. He was a bit chunky and not much taller than me. Nor did he move very fast as Gaynelle and I bore down on him like a freight train. Instead of screaming in fear and fleeing out the front door-which stood wide open to help facilitate his escape-he turned away from the cabinet he had opened and threw something heavy. It was a Mason jar, and it hit poor Gaynelle right smack in the middle of the forehead. She dropped to the floor like a sack of flour. I looked down at her, then up at the masked intruder. Eyes glittered at me from the tiny eyeholes, and as he seemed to be unarmed-no more Mason jars at hand-I let out a bellow and charged him."